I love seafood, and crab in particular. 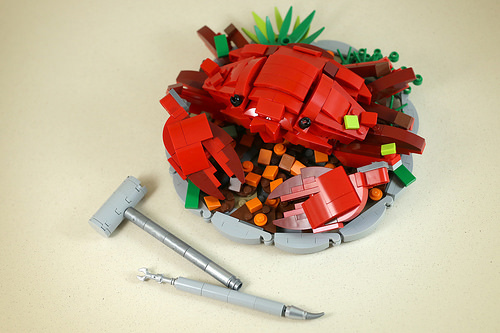 Here in the Pacific Northwest, one of the best ways to have it is to get fresh dungeness crab and crack it yourself, so this typhoon shelter crab dish by LEGO 7, made with a fresh whole crab, feels right at home and makes me very hungry. The builder even includes some tools of the trade, useful for scavenging every last bit of tasty meat from the shell.